NASA's Mars Reconnaissance Orbiter got a good look at a fascinating field of rocks laid out in piles at regular intervals. The natural world has a reputation for being wild, but it can also be incredibly orderly. The same goes for the landscape on Mars. NASA released an image Tuesday showing a very alien-looking Mars surface area with a series of neatly laid boulder piles. The space agency titled the image with a Sherlock Holmes mystery-style name: "The Case of the Martian Boulder Piles." The dunes are fun, but the boulder piles are especially interesting. 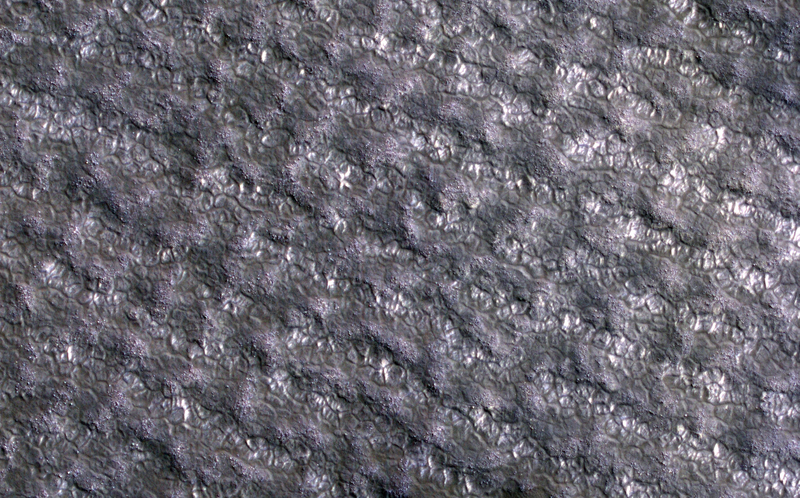 The first thing that jumps out from the Mars Reconnaissance Orbiter image are the dark, curved sand dunes. The dunes are cool, but NASA scientists are particularly interested in the formations seen in the open, patterned section of the landscape. You can make out a series of dark and light stripes running from the upper left corner of the image down to the lower right. NASA provided a closer look that highlights the landscape's striped appearance. The boulders are piled in the dark areas. The striped areas with neat boulder piles are more obvious in this closer view of Mars. NASA is now asking how these polar boulder piles got so well organized. Spoiler: It's not compulsive aliens. One possibility is "frost heave," a process we see on Earth in the Arctic where freeze-and-thaw cycles push rocks into neat shapes, including stripes or piles. "Frost heave can be strong enough to move and damage roads, bridges, and buildings," according to the National Snow & Ice Data Center. Mars doesn't have to worry about building or road damage, but it does have plenty of boulders than can get pushed around. The MRO image is reminiscent of a series of much smaller "rock stripes" seen by the Mars Opportunity rover. These may also have a freeze-thaw origin. Despite decades of NASA study, Mars is still offering up plenty of mysteries for our scientists to ponder.